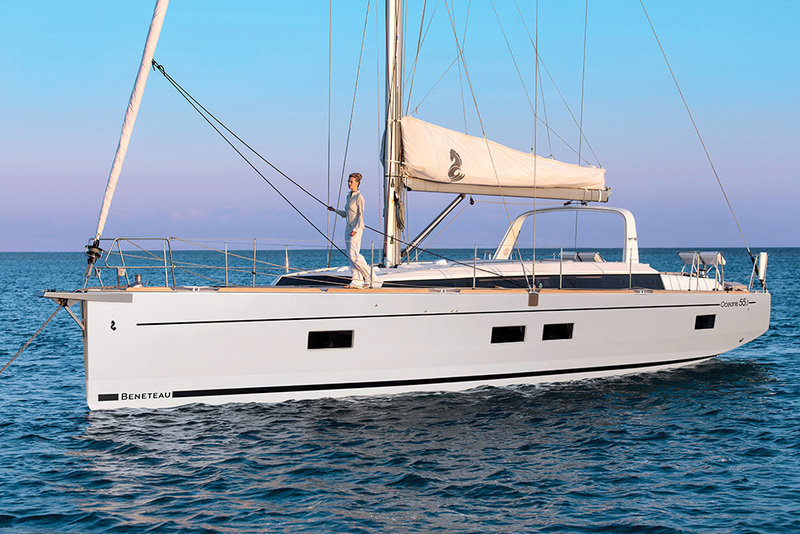 The Beneteau Oceanis range of sailboats has long been known as the market leader because of their adaptability to blue water cruising or around the buoy racing in your local harbor. 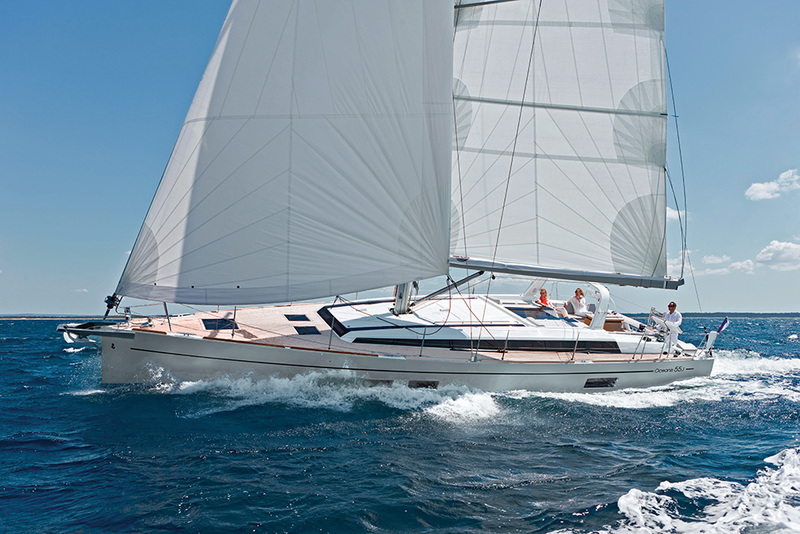 The newest and most luxurious to join this family of open ocean adventurers is the Oceanis 55.1. The 55.1 follows on the heels of the hugely successful Oceanis 55, but offers even more performance and innovation. Her lines are both contemporary and classic, which make her look as fast anchored as she is under full sail. She has been designed and built to take on epic adventures, yet is not the least bit intimidating when it comes to handling, docking, comfort and luxury. Everyone onboard from the captain to guests will be able to tell this is a boat of distinguished pedigree. Her hull is balanced to handle the sea’s many moods with confidence and with the highest degree of safety — even while being sailed single-handed. Her furling mast is controlled by winches moved aft to the twin helm wheels and a self-tacking jib comes standard. Her many other topside attributes include a huge cockpit with options for natural wood decking. Her reinforced electric transom swings down into a swim platform with a stainless steel ladder providing easy access to the sea. At the bow, a spacious foredeck makes for a generous sunbathing area and creates the perfect environment to relax at anchor. A 45-degree companionway entry takes you below deck to your home away from home. Gone are the days when a few portholes let in only enough light to keep you from stubbing your toes or barking your shins in the dark. 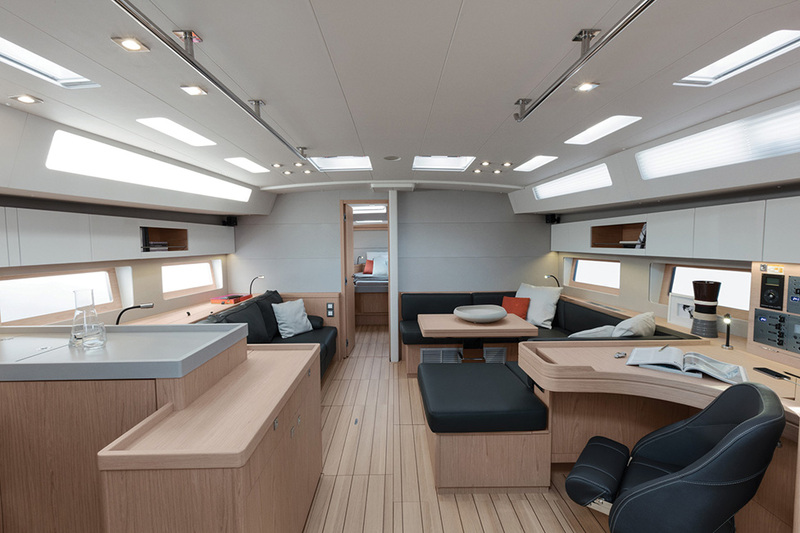 The Oceanis 55.1’s main salon, galley and berths are bathed in natural light thanks to large windows running along the port and starboard sides and plenty of skylights. The optional wood choices can change the look from traditional to contemporary. The enormous modular salon features the flexibility you’ll need during your many adventures. Her fully-fitted, U-shaped galley at the bottom of the companionway to starboard features a double sink and large Kerrock worktop. Seating is easily arranged for more room around the table at mealtime. Later, the seating can be rearranged providing the space needed for entertaining or unwinding after a fun day of sailing. 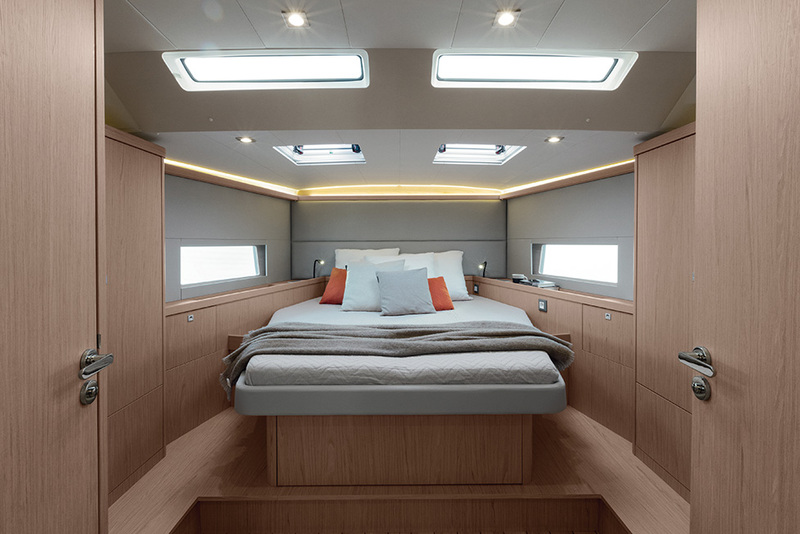 Toward the bow, the master suite is lined with a brilliant system of shelves, drawers and two large hanging lockers designed to maximize storage, a hallmark of Beneteau design. It also boasts an en suite head with separate shower. 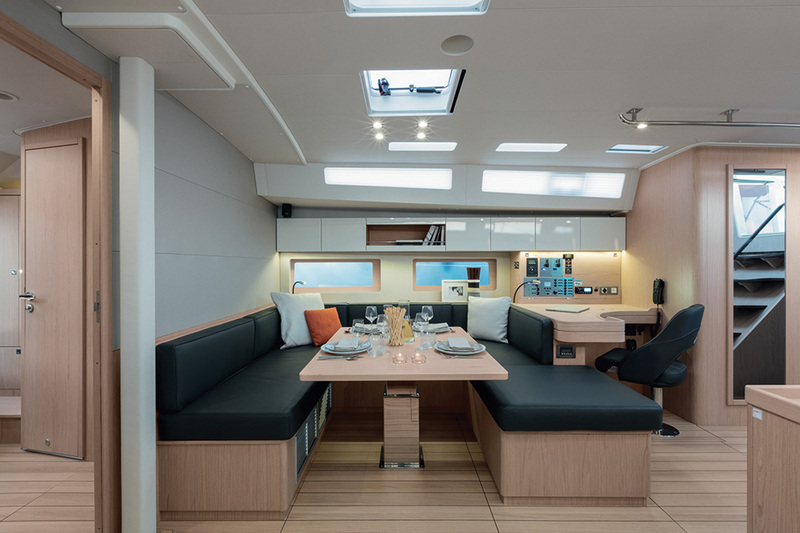 The Oceanis 55.1 offers a variety of possible layouts including: 3 cabins, 2 heads; 3 cabins, 3 heads; 4 cabins, 4 heads; and 5 cabins, 3 heads. Since her introduction in 2017, the Oceanis 55.1 has been turning the heads of sailors and journalists alike and has become one of the most highly coveted boats all along the coasts. It looks like her adventure is just beginning! 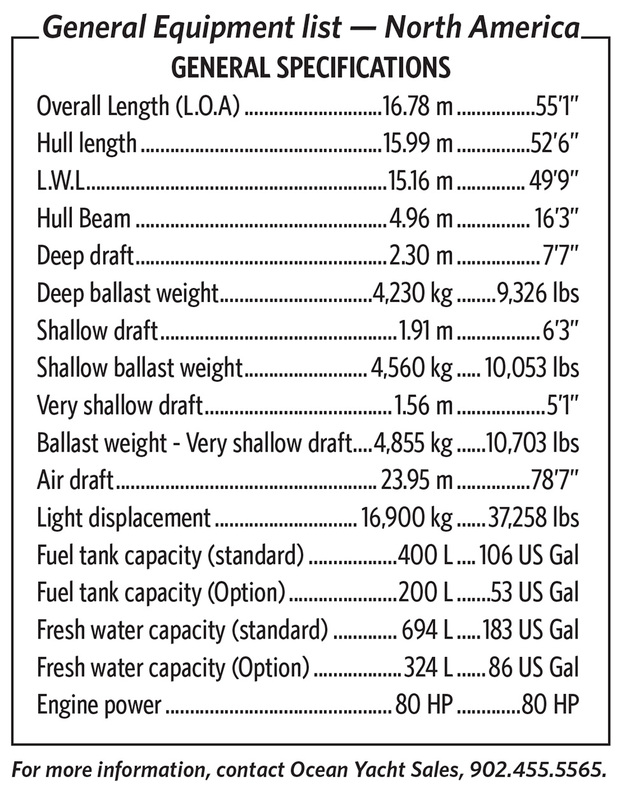 No Replies to "Oceanis 55.1: The Blue-Water Cruising Standard"